RNA-programmable CRISPR enzymes are used for wide-ranging applications including genome engineering. CRISPR nucleases in complex with a guide-RNA searches for its target DNA, unwinds it, and if the DNA sequence matches the RNA sequence over a critical length, cleaves the DNA at a specific location. How the CRISPR system can identify a correct target rapidly and accurately is an important question that has implications on potentially increasing the on-target cleavage activity and decreasing the off-target cleavage activity. CPLC student Digvijay Singh in the group of Prof. Taekjip Ha, in collaboration with the Doudna lab at UC Berkeley, developed single-molecule fluorescence measurement technologies to perform comparative analysisof CRISPR-enzymes, the most widely used Cas9, its engineered derivatives (EngCas9), and Cpf1. The group found that all Cas9s, including EngCas9s, require only 9-10 base pair (bp) matches for stable binding and ~16 bp match for cleavage. Cpf1 was significantly more specific in binding, requiring ~17 bp. 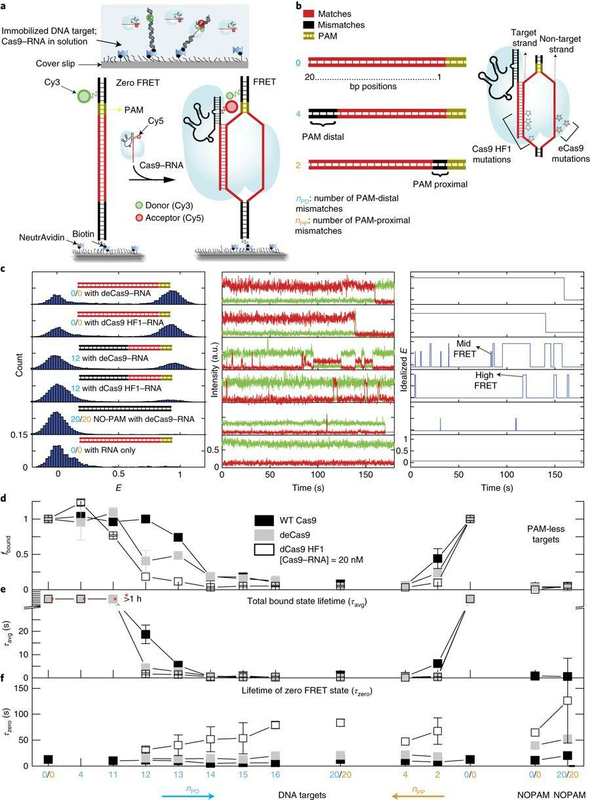 Singh also developed a single molecule FRET DNA unwinding assay and showed that Cas9 cleaves DNA only from the maximally unwound DNA state. Partial sequence mismatches that perturb cleavage also showed reduction of DNA unwinding, confirming that DNA unwinding is a critical checkpoint for cleavage of the correct target. EngCas9s mutations destabilize the unwound state thereby reducing its extent and lifetime, even for DNA with very few sequence mismatches, contributing to the enhanced specificity of cleavage. Following proofreading, EngCas9s nuclease domains also take longer to activate and cleave. All of these form the basis of improved cleavage specificity of EngCas9s.